Chatsworth Country Fair - September 2016. Believe it or not, Chatsworth Country Show celebrated it's 35th anniversary this weekend and incredibly, I've never attended one despite having visited the Chatsworth estate numerous times and only living 30 minutes away. Since the early years, the size and popularity of the show has increased drastically with visitor numbers and stall holders pretty much doubling in size. I went along with one thing in particular in mind, food. The food stands have always been a staple to visitors and with over 100 food stalls to make my way through, I was ready to go! After a slightly longer than normal journey (there was quite a queue to get into the grounds), we arrived and headed towards Chatsworth House. The walkway was lined with an array of old service vehicles which were great to look at. So, the majority of the stalls that I visited were food related. It was inevitable really. There was some amazing produce on sale and it was so good to see so many local businesses there too, many of which I've either seen or bought from previously. How amazing do these giant Jammy Dodgers look!? I'm so upset that I didn't buy one. I knew I'd regret it!! The Tea Room was very popular. It was great to see quite a few stalls selling (relatively) healthy food too. We bought a tub of Strawberries with optional cream but they were also selling fruit smoothies, there were stalls selling frozen yoghurt and even catering vans with healthy options too. I however, didn't opt for a healthy lunch and chose to visit the Fish & Chip wagon. At £9 including a bottle of water, it's the probably the most expensive one I've ever bought. But I guess that's all part of any festival type event. If you didn't know already, we have a Beagle called Bob. 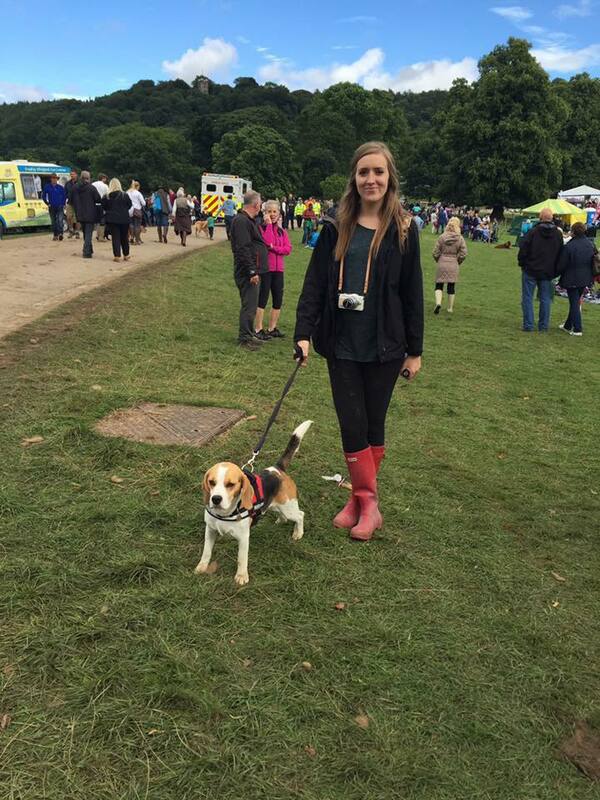 As the Chatsworth Country Show is dog friendly, we decided to bring him along for the day. I think he enjoyed it. There were plenty of other dogs to sniff and lots of food dropped on the floor to eat. I had such a lovely day at Chatsworth Country Show. After a rather dull, wet start, the sun soon decided to break through to give us a lovely afternoon to enjoy. I think one of the best parts about the show is that there's something for everybody to enjoy - anybody who visits will not be disappointed. At £25 per person, it soon adds up to be a pricey day out but if you're willing to make the most of it, it's more than worth it. Also, I just had to make a point of sharing how incredible the traffic management procedures were for exiting the event. After something like this, I always dread the huge queues and rush to get out once it's all over. The one way system that was put in place worked a treat and made the journey home so much more pleasant than I anticipated. They had clearly thought ahead and it paid off big time. Well done! I'll be sure to visit again next year, I'm just shocked I haven't been sooner. See you at Christmas Chatsworth! Have you ever been to Chatsworth Show? What did you think?